Children sit facing one another. Two 12" seats attached w/ rope. Available in Green. For Residential use. Assembly required. Check out this great new swing. Kids looking for something different, something you remember? Finally a glider swing where you can look at each other! Durable molded plastic seat backs, seats and foot board. Attaches to green coated metal frame tubes. (all hardware and caps included for easy assembly) Suspended by 1/2" soft rope with plenty of room for height adjustment. 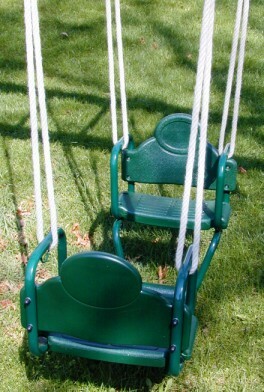 Designed for two children and maximizes a swing position on your set. Glider mounting brackets not included but recommended for mounting swing to a single beam. 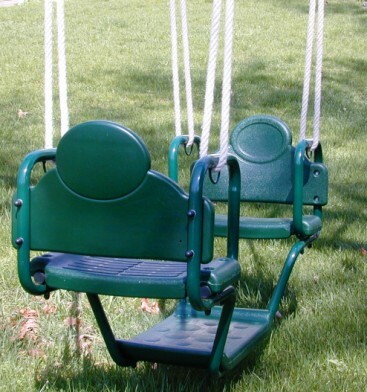 A necessity for any glider swing. This set of brackets will allow you to mount your glider swing (or any other 4 roped swing) to a single swing beam. Sold in pairs (2 brackets.) Available in green, yellow, or blue. $46.95 EA pair.